Ivory Kete, 14, is a grade five student at the Titinge Primary School, located on a ridge along the southern outskirt of the capital, Honiara. I met her recently when I accompanied a UNICEF photographer capturing world class photos of children and children’s issues in the pacific. Interestingly Ivory lives with her parents at Taba’a community which is more than an hour if you’re walking from the school. Each morning Ivory would have to wake up very early, do her house chores, get dressed and begin her walk along the bush track that leads to the school. “By the time I reach the school I would have to find somewhere, most often a tree shade for me to cool off before going to class because it is very uncomfortable and sometimes embarrassing for me to sit with my classmates soaked in sweat”, she complained. Ivory said that the distress each morning was not helping her learning adding that this can go on for the rest of the day especially on sunny days. Obviously this is so, because the school’s roofing iron and paper thin ceiling allows the sun’s heat to easily penetrate into the classrooms. “Many times I had to use my exercise book to fan myself which even made it more difficult to focus and learn anything from the teacher”, Ivory explained. But this all changed for her. In 2013 a set of solar panels, ceiling fans and light bulbs were installed at Ivory’s school. 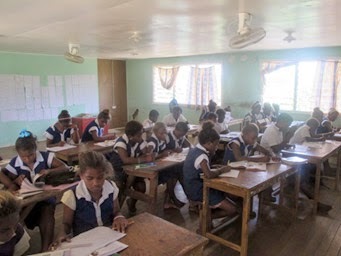 This is part of an ongoing “solar power for schools”, pilot project, funded by the New Zealand government and implemented by UNICEF Pacific through its Solomon Islands field office in collaboration with the Ministry of Education and Human Resources. Ivory told me that she was excited when men came to install the sets of solar panel, fans and light bulb because she knew from then that her classroom would now be much more comfortable and enjoyable to learn in. “Now I don’t need a tree shade anymore as I can simply flip the power switch on and enjoy the comfort from the fan breeze for the rest of the day. With this, I am able to concentrate, understand and learn much more easily than before” Ivory said with a smile. I then met the school’s Deputy Head teacher Mr Hudson Sahi who told me that the solar power has not only been helpful to the students but also the teachers. “We are now able to stay up late in the evening preparing our lessons and activities for the next day. We couldn't do this before because there were no lights and even if we use kerosene lamps it only attracts mosquitoes”. Mr Sahi explained that the fans are just as important as the lights at night because they keep the mosquitoes away. Since the beginning of the year, Titinge Primary has experienced an increase in enrolment. “In 2013 we had a total of 153 students but this year we had to stop any further intakes because we have reached a total of 230 students which is more than the school can take. I can confidently say that the upgrade of the school with the solar panels has played a major role in this,” explained Mr Sahi. Titinge Primary together with four other primary schools in Guadalcanal Province are part of Phase 1 of the solar power for school pilot project. Phase 2 of the project will be carried out in another five primary schools in Choiseul Province this year. The Solar Power for School pilot project aims to improve learning environment for students, facilitate class preparation after hours by teachers and enable extra-curricular activities to take place in schools late in the evening or at night time. Hi, it was very nice to get so much information under a single blog regarding Solar power and solar energy. Thanks for posting such a useful information.